I came across an old Yiddish folk song “Tumbalalaika” and found the lyrics rather amusing. Are you the type who will quiz your future mate to scrutinize his or her intelligence or integrity? Or, will you, like most of us, simply fall head over heels for the one with whom you think you will live happily ever after? Compared to this tough question, perhaps learning Chinese isn’t so hard after all. Here is my translation of a couple of the stanzas of the song. If you would like to read or sing along, please click on this link: Sing Tumbalalaika in Chinese. Shàonǚ, shàonǚ, wǒ qǐngwèn nǐ. Maiden, maiden, may I ask you. Shénme huì chéngzhǎng, dàn bùyòng yǔshuǐ? What can grow, but it needs no rain? Shénme huì ránshāo, yǒngyuǎn bù tíngxī? What burns forever and never will end? Shénme huì sīniàn, dàn bù liú lèi? Which thing can yearn, but sheds not a tear? Tumbalalaika, tán wǒmén de pípa. Tumbalalaika, may we be happy! Young man, young man, no problem at all. Yánshí huì chéngzhǎng, dàn bùyòng yǔshuǐ. A rock can grow, but it needs no rain. Àiqíng huì ránshāo, yǒngyuǎn bù tíngxī. Love burns forever and never will end. Zhēnxīn huì sīniàn, dàn bù liú lèi. True heart can yearn, but sheds not a tear. In the above, the Chinese verses mostly parallel the English verses and should be easy to understand. Please note, however, that the 琵琶 (pípa pipa) and the balalaika are two different musical instruments. 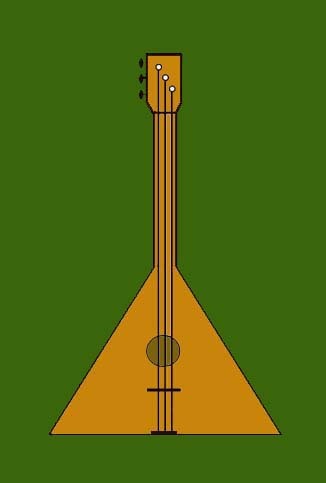 The balalaika has three strings. It was featured in the film “Dr. Zhivago”. On the other hand, pipa is a Chinese musical instrument that has four strings. I used this word as it rhymes with balalaika. I could as well have used 吉他 (jítā guitar) instead. Another thing worth pointing out is that the Chinese expression for “will never” is phrased as “always will not”, namely 永远不 (yǒngyuǎn bù) or 永不 (yǒng bù) for short. Please see “Learn Chinese through Songs and Rhymes” for more songs and rhymes to sing or read in Chinese.